The beauty of the Internet is that you get to discover so many cool things, even though some of them may be old. Today’s post is an example of an oldie, but goodie. I am not sure if you have seen it already, but I have to admit that today is the first time I laid my eyes on it. How long have you been on Twitter? Think back to the first time you heard of the platform. Did you immediately jump into the bandwagon? Did you immediately create an account? I don’t know about you, but it took me a while. I remember checking it out then forgetting about it. Then my nerd of a brother-in-law convinced me to create an account. I didn’t immediately start tweeting like crazy (not that I do that now! ), though. It still took me a while to get into the whole tweeting thing, and I also have to say that even now, sometimes I don’t get how/what people tweet. But that’s a whole different story. 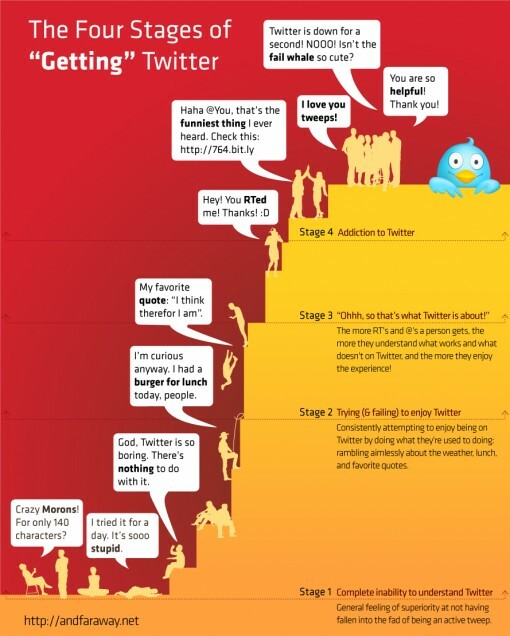 Some time last year, they guys at AndFarAway created this amusing visualization of the Four Stages of Getting Twitter. The stages are simple and distinct, and I am pretty sure that many of you went through them as well. Stage 1: Complete inability to understand Twitter. I suppose many people really are unable to get it. I still have friends these days asking me about the platform. What is it? What do you do with it? Why should I create an account? A person may or may not care enough to create an account. Stage 2: Trying and failing to enjoy Twitter. Stage 2 of the Four Stages of Getting Twitter means a person may give the platform a try. It doesn’t necessarily follow, however, that he or she will dive right into things. Boring. I think that’s the most commonly used word at this stage, especially if the person doesn’t have a lot of followers/is not following a lot of (interesting) people. Stage 3: Ohhh, so that’s what Twitter is about! When the mentions, replies, and RTs start rolling in – even slowly – the realization that Twitter can be fun dawns on you. Oh, to have that feeling again! And…you’re hooked. I remember one tweet that just might be my all-time favorite: “I am NOT addicted to Twitter. I can stop any time I want to.” Or something to that effect. And with that statement, I leave you the visualization.